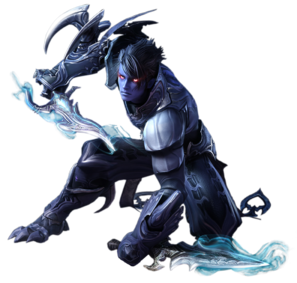 The Assassin is the master of the shadows of Aion and has the best stealth and one of the highest damage bursts of all the classes. Assassins are also excellent in disabling and locking down their targets. These abilities go hand in hand, as an expert Assassin can sneak up on his target and burst it down before his target can even react. Assassins are one of the highest DPS classes and are extremely deadly in both PvE and PvP. Their weapons of choice are either dual wielded swords, daggers, or a combination of the two. While assassins are also proficient with bows, a bow is generally only used by Assassins to kite or chase a fleeing target. In general, assassins are known for their ability to approach their targets completely undetected and lock them down while dealing massive amounts of damage. Dual wielding swords grant a higher base damage output, but lower Crit Strike. Swords have a base Crit Strike of 50, compared to the 100 from daggers, and players must slot more Crit Strike to reach the crit soft cap. Swords are a 3-strike weapon and do more base damage per swing when auto-attacking. Dual wielding daggers grant increased accuracy, attack speed and a higher base Crit Strike. Dagger’s base attack speed is 1.2s (compared to the 1.4s for swords). While the daggers generally do less damage per attack, the increased attack speed and accuracy make them viable in combat. With the daggers higher crit strike chance, players can choose to slot attack manastones instead of crit strike to augment their damage. In solo play, an Assassin will usually kill a target mob in seconds. However, as their buffs run out and are on cooldown, the Assassin will take some damage as they engage mobs and will have to rest to regenerate shortly. As such, their solo grinding ability is mediocre when compared to a ranged class. With the use of life potions however, an Assassin will have no problems continuously killing mobs with ease. In group play, Assassins are sought after as they provide excellent DPS. It is possible for a well geared Assassin to “steal” a mob’s aggro from even a Templar through the sheer amount of damage done. Also, in end-game, well geared Assassins can main tank many instances, provided that their group can CC or hold aggro on multiple targets. One thing to note is that if there are two or more Assassins in the same group, they will share the runes they carve on a single mob, meaning that if one Assassin uses the runes, the other Assassin will not get the full effect of their rune skill. In solo PvP, an Assassin is unmatched by any other class. With the use of Shadow Walk, an assassin can stay in advanced hide state indefinitely, making them undetectable to all other classes except Rangers, mid level Gunslingers, and other Assassins, who can only detect them once every five minutes. With this being the case, the Assassin can usually be assured that no one will detect them as they sneak up on their target. Also, as the Assassin has a plethora of stun and disabling skills, once an attack has been initiated, it is safe to assume that the target will never even get a skill off before the assassin kills them. If at any time, things begin to look badly for them, Assassins can simply outrun their enemies with the use of their Sprinting skill. Usually, everything is decided within the first ten seconds of an engagement and will end with one of three outcomes: The target is either dead, the target is attempting to run, or you should sprint away, hide, then try again as the attack has failed. In group PvP, an Assassin will usually help focus down the main target of a group by locking them down and incapacitating them. The Assassin can also provide advanced scouting through the use of their hide skills and can flank an enemy group as the main group attacks from the front. In summary, the Assassin is a surprise attack class that requires a certain degree of skill and awareness to effectively manage positioning, stun timing, aetherhold timing, and the use and choice of rune skills. This becomes all the more true in PvP, where mastering the timing on a stun/skill rotation may be the difference in a failed attack or a dead target. In PvE, the difficulty is much more lax, as a failed attack just means the Assassin will be attacking for a bit longer. In most scenarios, be it PvE or PvP, assassins usually have one thing to optimize; attack. As assassins already get excellent buffs that raise their damage, critical rate and attack speed, the only thing left to improve is the actual damage dealt. As most assassins by endgame socket only attack manastones in all their gear, acquiring gear with lots of manastone slots will quickly and drastically improve an assassin’s rate of dps. Also, using swords (at least one with an attack speed boost) over daggers will ultimately result in higher damage dealt, as swords deal more damage and assassins can easily hit the attack speed cap with the use of their Flurry skill.